The book draws on empirical research exploring mainstream religious belief and identity in Euro-American countries. 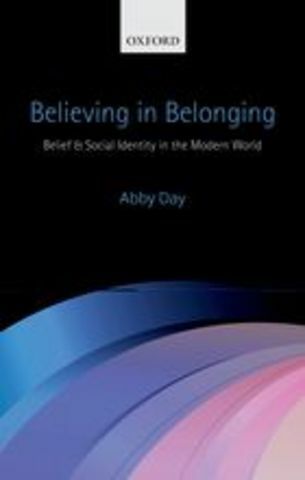 Starting from a qualitative study based in northern England, and then broadening the data to include Europe and North America, the book explores how people ‘believe in belonging’, choosing religious identifications to complement other social and emotional experiences of ‘belongings’. The concept of ‘performative belief‘ helps explain how otherwise non-religious people can bring into being a Christian identity related to social belongings. Further, it is argued that what is often dismissed as ‘nominal‘ belief is far from an empty category, but one loaded with cultural ‘stuff‘ and meaning. Day introduces an original typology of natal, ethnic and aspirational nominalism that challenges established disciplinary theory in both the European and North American schools of the sociology of religion that assert that most people are ‘unchurched‘ or ‘believe without belonging‘ while privately maintaining beliefs in God and other ‘spiritual‘ phenomena. Day creates a unique analysis and synthesis of anthropological and sociological understandings of belief and proposes a holistic, organic, multidimensional analytical framework to allow rich cross cultural comparisons. Chapters focus in particular on: methods for researching belief without asking religious questions, the acts of claiming cultural identity, youth, gender, the ‘social‘ supernatural, fate and agency, morality and a distinction between anthropocentric and theocentric orientations that provides a richer understanding of belief than conventional religious/secular distinctions.